The University of Bradford is holding a free archaeology open day on the 22nd of November 2014 from 10am to 3pm as a part of the UK nation wide Becoming Human festival. The University of Bradford’s day long event will feature a myriad of archaeologically-themed interactive showcases. This will include stalls focusing on broad topics such as human evolution, past and present attitudes towards death, the role and function of pottery in prehistoric societies, and will also include a look at the fascinating Digitised Diseases project which highlights the value of 3D printing and digital visualisation in archaeology, among many other topics. The event is free to attend, family friendly and does not need to be booked in advance. Poster for the open day. Image credit: Bradford University. But what is the Becoming Human festival about? Boiled down to its basic parts the festival hopes to challenge and inspire members of the public to think about just what it means to be considered human and what that means for us as a species today, how we interact with each other and why we do the things that we do. The festival is all about the public engagement on a national-wide scale of current research in humanities that is being conducted in the country. Throughout November 2014 (15th to the 23rd) there will be more than 150 individual events at a range of geographic locations helping to promote the value and wealth of humanities topics. Poets and writers such as Will Self and Simon Armitage will be taking part as will the comedian Al Murray, in an effort to engage both your intellect and your imagination. The other aims of the festival are to foster knowledge that is vital and accessible for all (something we bloggers can fully agree with! ), and to help us understand ourselves and recognize the challenges that we face today. In partnership with the Arts and Humanities Research Council (AHRC) and the British Academy, the Becoming Human festival is led by the School of Advanced Study at the University of London. The aim of the 2014 festival is to gauge the appetite for an annual nation-wide festival celebrating the humanities subjects in all of their diversity. As such archaeology will play a small but determined part within the 2014 festival, and the event at the University of Bradford highlights just why archaeology is so fundamentally important in understanding what it means to be human, both where have come from and understanding the implications for where we could be heading as a species. “The interactive stalls will be headed by prominent researchers such as Professor Ian Armit and Dr. Lindsey Buster, showcasing their work on Scupltor’s Cave. Also contributing is the Jisc supported project Digitised Diseases, led by Dr. Andrew Wilson; a digital database for the viewing of fragile human skeletal remains with diagnostic attributes. Dr. Adrian Evans will be demonstrating the key technologies and ideas that make up the multi million pound Fragmented Heritage Project, along with Dr Randolph Donahue who will be showing off the evolutionary family tree and Dr. Karina Croucher, who will be discussing attitudes towards life and death. PhD researchers Rebecca Nicholls, Mike Copper and Emily Fioccoprile have also kindly contributed activities based on their PhD projects”. 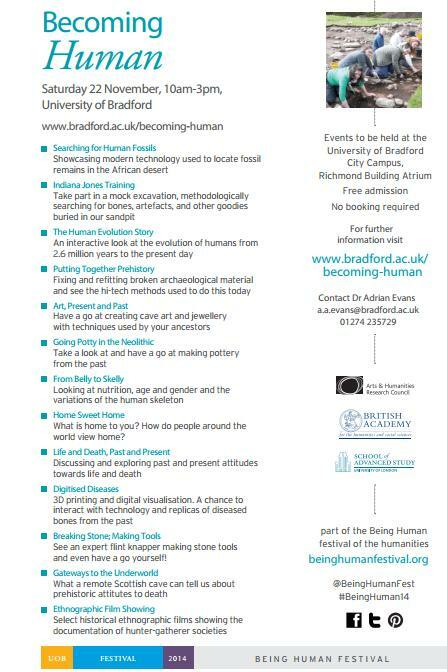 The program for Becoming Human at the department of archaeological sciences, Bradford. Image credit: Bradford University. So if you are around in Yorkshire or near Bradford on the 22nd of November pop over to the archaeology department and learn about the human past in a fun and interactive environment! Learn more about the enticing Becoming Human festival here and browse the events by date and geographic location here. 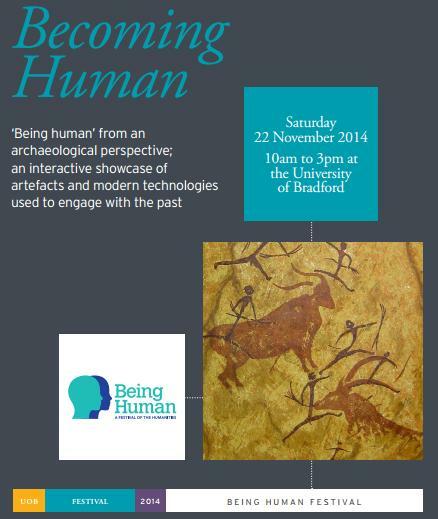 Learn more about the University of Bradford archaeology themed Becoming Human day here. Visited the open day and keen to learn more about the department of archaeology at Bradford? Visit here! Keep up to date with the rich variety of archaeological projects at Bradford via Dr. Karina Croucher’s twitter feed or visit her awesome blog focusing on both gender & identity and death & dying in the past and present.